Striker Savenaca Nakalevu has put Suva in the final of today’s Inkk Mo­bile Battle of the Giants tournament. 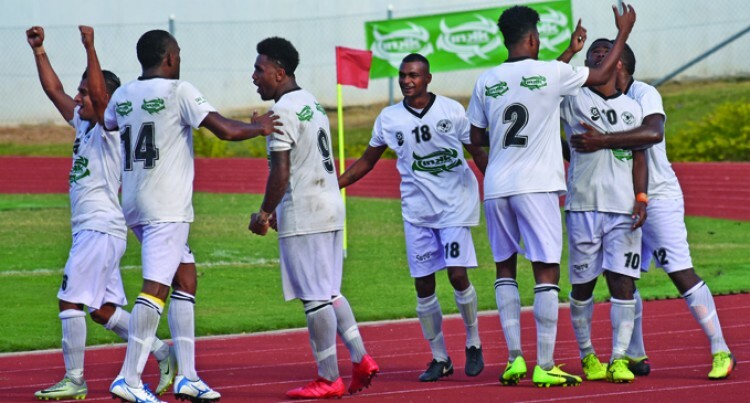 The Wailotua, Wainibuka native scored in the second spell of extra time against Labasa in the first semifinal at Churchill Park, Lautoka yesterday. The 1-0 win has set the course for Suva to end their 23-year winless jinx in the B.O.G but first they need to beat Ba in the final today. Suva won the Giants tourney in 1995 and also in 1982 and 1988. What happened: Both teams tried their best but failed to create scoring opportuni­ties for their strikers. The capital city had the services of Ra­vinesh Karan Singh, Sakaraia Naisua, Simione Tamanisau, Remueru Tekiate, Bruce Hughes and Filipe Baravilala. Halftime: Suva 0- 0 Labasa. On the other hand the Babasiga Lions had the services of Taniela Waqa, Akuila Mateisuva, Christopher Wasasala, Lekima Gonerau and Edwin Shayam. In the 76th minute Hughes shot was de­nied by goalkeeper Akuila Mateisuva. In the 80th minute Lekima Gonerau made a break to score after he beat Suva goal­keeper Tamanisau but hit the left hand of the post. First spell of extra time: Suva 0-0 Labasa. Nakalevu’s goal in the second spell of ex­tra time saw Suva fans celebrating. Big Play: Simione Tamanisau’s experi­ence boost the capital side. Star Turn: Savenaca Nakalevu scoring the winner. Comments: Suva coach Gurjeet Singh said, “This B.O. G is a tough competition and Labasa was a good team. We were with­out two of our central defenders and we had to make changes.